I love pinterest (is there anybody who doesn't enjoy wasting time researching on pinterest? ), but it can be a time waster, so I decided to try making pinterest work for me, and use it to gather ideas in one place. I've been collecting Christmas ideas for a long time (my first Christmas board is yes, I'm collecting Christmas ideas already), and straight after last Christmas I started collecting ideas on the board next year I'll do that. I collect ideas for cookies, handmade gifts, decorating, ornaments, scrapbooking and cards. I also moved all the Christmas-related boards to the top of my profile, so they're easier for me to find. 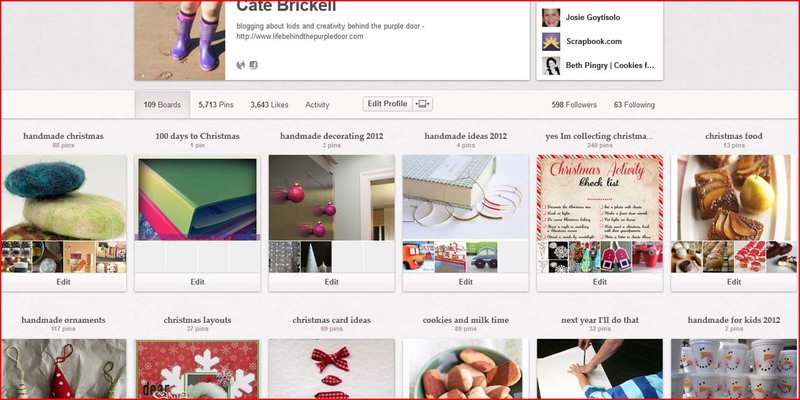 How will you use pinterest this holiday season? Hopefully to plan the menu for the Chosen One's surprise 50th birthday party. His birthday is the 24th, the surprise party the 15th, he thinks it's a Christmas Open House. Also hoping to pin some gift ideas and possibly some things to make and sell. Pinterest has helped me become more productive with all the DIY and crafting ideas I have running around in my head. If I have a free evening, I'll look at my boards and pick an idea to try. I have a board for housekeeping/organization tips, and another one for fonts (I looked through A TON of fonts while designing banners for my blog and another Web site). Even if I don't have a specific project in mind, looking over my boards helped me zero in on what my personal taste in and it's helped me become more focused when shopping for clothing or house stuff. Pinterest can be a procrastination tool, but in my case, it's been a great tool.